What might drive a man to eat his own coat? The answer can be found in the newly digitized journal of Percy Broughton, an Anglican missionary. The journal itself originates from the Museum of Anthropology (MOA) and the digitization is a joint project filed under Special Projects with Digital Initiatives. Percy’s Signature which appears at the beginning of his day journal. Broughton, a missionary whom we know little about, served the Church Missionary Society in Lake Harbour (Kimmirut) on Baffin Island from 1911 to 1912. His most famous circulating story is that of eating part of his own deerskin coat while being stranded outdoors for two days after losing his Inuit guides . But eating his own wardrobe wasn’t his only adventure outlined in his journal. Broughton discusses his experiences, expenses, and trips taken through Europe, East Asia, South Africa, Australia, the South Pacific as well as various parts of Canada. He also incorporates descriptions of everyday life from the hardships of Inuit and mission life, to sickness, to lack of food. Other notations include biblical notations for sermons, lists of names of sick people with dates, baptismal records, and commentary on World War I. 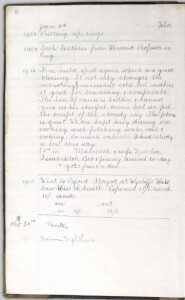 The journal entry for New Year’s Day 1912. The “Hobo band …raised the most hideous row” the night before. The log is laid out as a day journal with writings for multiple years appearing on the same page. Broughton’s writings appear both before and after his trip to Baffin Island, a journey that changed the course of his life. The same day of the year is recorded on the same page for several years in a day journal. Check out the difference on this page before and after Broughton’s trip north. Check out his journal here or just click on the pages. If you are interested to see more a number of things he collected on his journeys are now housed in the MOA. You can check them out here. Harper, Kenn. “Percy Broughton, the Unknown Missionary – Part 2.” Nunatsiq Online. NUNATSIAQ NEWS, 11 Nov. 2010. Web. <http://www.nunatsiaqonline.ca/stories/article/taissumani_nov._12/>.